and pad wear, and increased stopping distances. • When descending a long or steep hill, shift to a lower gear and avoid continuous application of the brakes. Continuous brake application will cause the brakes to overheat and could result in a temporary loss of braking performance. • Wet brakes may impair the vehicle’s ability to safely slow down; the vehicle may also pull to one side when the brakes are applied. Applying the brakes lightly will indicate whether they have been affected in this way. Always test your brakes in this fashion after driving through deep water. To dry the brakes, apply them lightly while maintaining a safe forward speed until brake performance returns to normal. In the event of brake failure If service brakes fail to operate while the vehicle is in motion, you can make an emergency stop with the parking brake. The stopping distance, however, will be much greater than normal. WARNING - Parking brake Applying the parking brake while the vehicle is moving at normal speeds can cause a sudden loss of control of the vehicle. If you must use the parking brake to stop the vehicle, use great caution in applying the brake. Disc brakes wear indicator When your brake pads are worn and new pads are required, you will hear a highpitched warning sound from your front brakes or rear brakes (if equipped). You may hear this sound come and go or it may occur whenever you depress the brake pedal. • To avoid costly brake repairs, do not continue to drive with worn brake pads. • Always replace the front or rear brake pads as pairs. This brake wear warning sound means your vehicle needs service. If you ignore this audible warning, you will eventually lose braking performance, which could lead to a serious accident. Rear drum brakes (if equipped) Your rear drum brakes do not have wear indicators. Therefore, have the rear brake linings inspected if you hear a rubbing noise. Also have your rear brakes inspected each time you change or rotate your tires and when you have the front brakes replaced. Applying the parking brake To engage the parking brake, first apply the foot brake and then without pressing the release button in, pull the parking brake lever up as far as possible. In addition it is recommended that when parking the vehicle on a gradient, the shift lever should be positioned in the appropriate low gear on manual transaxle vehicles or in the P (Park) position for automatic transaxle vehicles. Driving with the parking brake applied will cause excessive brake pad (or lining) and brake rotor wear. Releasing the parking brake To release the parking brake, first apply the foot brake and pull up the parking brake lever slightly. 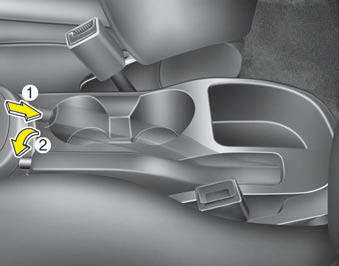 Secondly press the release button (1) and lower the parking brake lever (2) while holding the button. • To prevent unintentional movement when stopped and leaving the vehicle, do not use the shift lever instead of the parking brake. Set the parking brake AND make sure the shift lever is securely positioned in 1st (First) gear or R (Reverse) for manual transaxle equipped vehicles and in P (Park) for automatic transaxle equipped vehicles. • Never allow anyone who is unfamiliar with the vehicle to touch the parking brake. If the parking brake is released unintentionally, serious injury may occur. which can injure occupants or pedestrians. though vehicle control is improved during emergency braking, always maintain a safe distance between you and objects ahead. Vehicle speeds should always be reduced during extreme road conditions. The braking distance for vehicles equipped with an anti-lock braking system (or Electronic Stability Control System) may be longer than for those without it in the following road conditions. • Rough, gravel or snow-covered roads. • On roads where the road surface is pitted or has different surface height. A click sound may be heard in the engine compartment when the vehicle begins to move after the engine is started. These conditions are normal and indicate that the anti-lock brake system is functioning properly. • Even with the anti-lock brake system, your vehicle still requires sufficient stopping distance. Always maintain a safe distance from the vehicle in front of you. • Always slow down when cornering. 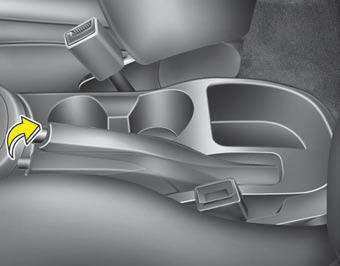 The anti-lock brake system cannot prevent accidents resulting from excessive speeds. • On loose or uneven road surfaces, operation of the anti-lock brake system may result in a longer stopping distance than for vehicles equipped with a conventional brake system. • If the ABS warning light is on and stays on, you may have a problem with the ABS. In this case, however, your regular brakes will work normally. • The ABS warning light will stay on for approximately 3 seconds after the ignition switch is ON. During that time, the ABS will go through self-diagnosis and the light will go off if everything is normal. If the light stays on, you may have a problem with your ABS. Contact an authorized KIA dealer as soon as possible. • When you drive on a road having poor traction, such as an icy road, and have operated your brakes continuously, the ABS will be active continuously and the ABS warning light may illuminate. Pull your car over to a safe place and stop the engine. • Restart the engine. If the ABS warning light goes off, then your ABS system is normal. Otherwise, you may have a problem with the ABS. Contact an authorized KIA dealer as soon as possible. When you jump start your vehicle because of a drained battery, the engine may not run as smoothly and the ABS warning light may turn on at the same time. This happens because of low battery voltage. It does not mean your ABS has malfunctioned. • Do not pump your brakes! • Have the battery recharged before driving the vehicle. The Electronic Stability control (ESC) system is designed to stabilize the vehicle during cornering maneuvers. 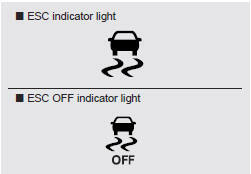 ESC checks where you are steering and where the vehicle is actually going. ESC applies the brakes on individual wheels and intervenes with the engine management system to stabilize the vehicle. Never drive too fast according to the road conditions or too quickly when cornering. Electronic stability control (ESC) will not prevent accidents. Excessive speed in turns, abrupt maneuvers and hydroplaning on wet surfaces can still result in serious accidents. Only a safe and attentive driver can prevent accidents by avoiding maneuvers that cause the vehicle to lose traction. Even with ESC installed, always follow all the normal precautions for driving - including driving at safe speeds for the conditions. The Electronic Stability Control (ESC) system is an electronic system designed to help the driver maintain vehicle control under adverse conditions. It is not a substitute for safe driving practices. Factors including speed, road conditions and driver steering input can all affect whether ESC will be effective in preventing a loss of control. It is still your responsibility to drive and corner at reasonable speeds and to leave a sufficient margin of safety. These conditions are normal and indicate that the Electronic Stability Control System is functioning properly. approximately 3 seconds, then ESC is turned on. • Press the ESC OFF button for at least half a second after turning the ignition ON to turn ESC off. (ESC OFF indicator will illuminate). To turn the ESC on, press the ESC OFF button (ESC OFF indicator light will go off). self-check and does not indicate a problem. When the ESC is in operation, ESC indicator light blinks. • When the Electronic Stability Control is operating properly, you can feel a slight pulsation in the vehicle. This is only the effect of brake control and indicates nothing unusual. • To cancel ESC operation, press the ESC OFF button (ESC OFF indicator light illuminates). • If the ignition switch is turned to LOCK position when ESC is off, ESC remains off. Upon restarting the engine, the ESC will automatically turn on again. When the ignition switch is turned ON, the indicator light illuminates, then goes off if ESC system is operating normally. The ESC indicator light blinks whenever ESC is operating and illuminates when ESC fails to operate. The ESC OFF indicator light comes on when the ESC is turned off with the button. Driving with varying tire or wheel sizes may cause the ESC system to malfunction. When replacing tires, make sure they are the same size as your original tires. The Electronic Stability Control system is only a driving aid; use precautions for safe driving by slowing down on curved, snowy, or icy roads. Drive slowly and don’t attempt to accelerate whenever the ESC indicator light is blinking, or when the road surface is slippery. 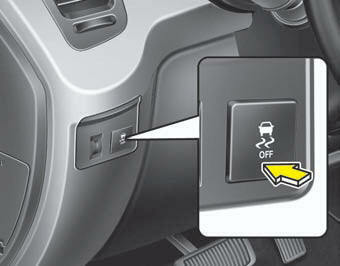 • It’s a good idea to keep the ESC turned on for daily driving whenever possible. • To turn ESC off while driving, press the ESC OFF button while driving on a flat road surface. • When operating the vehicle on a dynamometer, ensure that the ESC is turned off (ESC OFF light illuminated). If the ESC is left on, it may prevent the vehicle speed from increasing, and result in false diagnosis. • Turning the ESC off does not affect ABS or brake system operation. • Whenever you leave or park your vehicle, always set the parking brake as far as possible and shift the vehicle to 1st (First) gear or R (Reverse) for manual transaxle, or P (Park) for automatic transaxle. If the parking brake is not fully engaged, the vehicle may move inadvertently and injure yourself and others. • Check to be sure the parking brake is not engaged and the parking brake indicator light is out before driving away. • Driving through water may get the brakes wet. They can also get wet when the vehicle is washed. Wet brakes can be dangerous! Your vehicle will not stop as quickly if the brakes are wet.Wet brakes may cause the vehicle to pull to one side. • Don't coast down hills with the vehicle out of gear. This is extremely hazardous. Keep the vehicle in gear at all times, use the brakes to slow down, then shift to a lower gear so that engine braking will help you maintain a safe speed. • Don't "ride" the brake pedal. Resting your foot on the brake pedal while driving can be dangerous because the brakes might overheat and lose their effectiveness. It also increases the wear of the brake components. • If a tire goes flat while you are driving, apply the brakes gently and keep the vehicle pointed straight ahead while you slow down. When you are moving slowly enough for it to be safe to do so, pull off the road and stop in a safe place. • If your vehicle is equipped with an automatic transaxle, don't let your vehicle creep forward. To avoid creeping forward, keep your foot firmly on the brake pedal when the vehicle is stopped. • Be cautious when parking on a hill. Firmly engage the parking brake and place the shift lever in P (automatic transaxle) or in first or reverse gear (manual transaxle). If your vehicle is facing downhill, turn the front wheels into the curb to help keep the vehicle from rolling. If your vehicle is facing uphill, turn the front wheels away from the curb to help keep the vehicle from rolling. If there is no curb or if it is required by other conditions to keep the vehicle from rolling, block the wheels. • Under some conditions your parking brake can freeze in the engaged position. This is most likely to happen when there is an accumulation of snow or ice around or near the rear brakes or if the brakes are wet. If there is a risk that the parking brake may freeze, apply it only temporarily while you put the shift lever in P (automatic transaxle) or in first or reverse gear (manual transaxle) and block the rear wheels so the vehicle cannot roll. Then release the parking brake. • Do not hold the vehicle on the upgrade with the accelerator pedal. This can cause the transaxle to overheat. Always use the brake pedal or parking brake.